What a magical start to 2014! 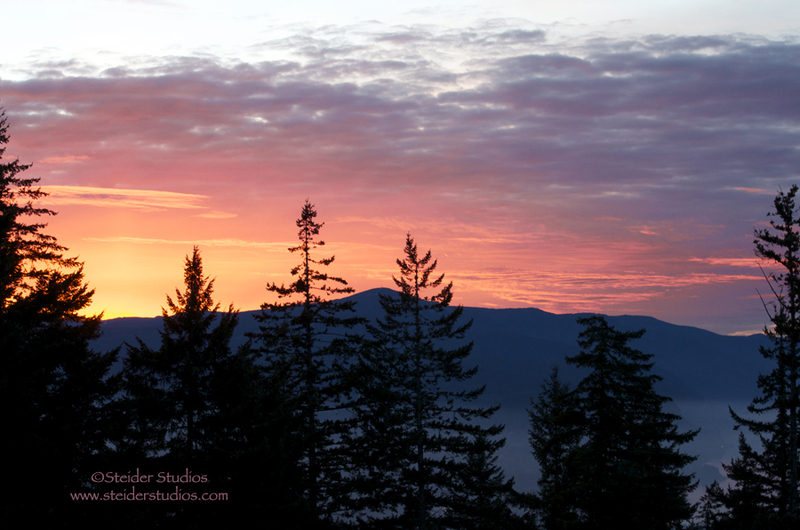 I was giddy with excitement as I watched the colors in the sky changing on the second evening of January. Overlooking the Columbia River Gorge watching the mist hovering over the river as the mountains darkened and the skies turned into a painting. No matter where I turned my camera an amazing array of color mixed with golden clouds. 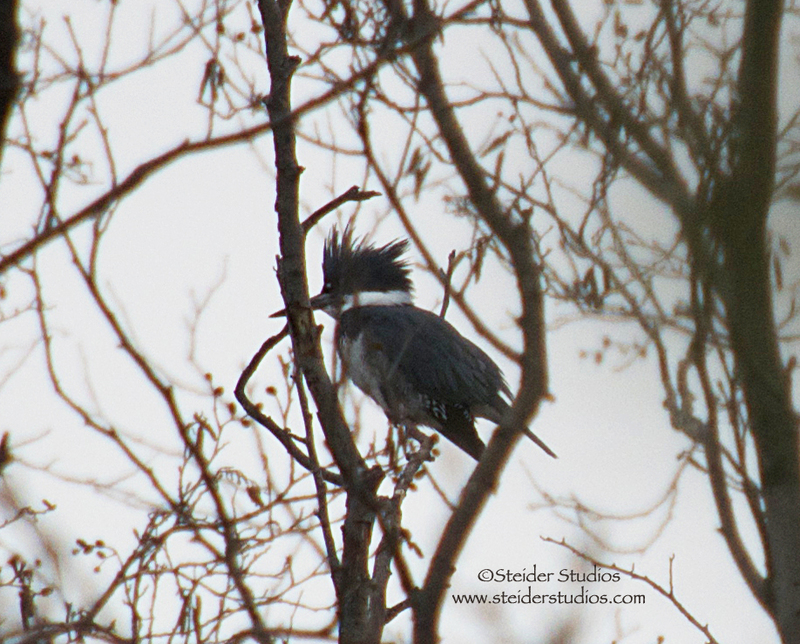 Cars were stopping on the road, all the neighbors were out staring at the sky in amazement. 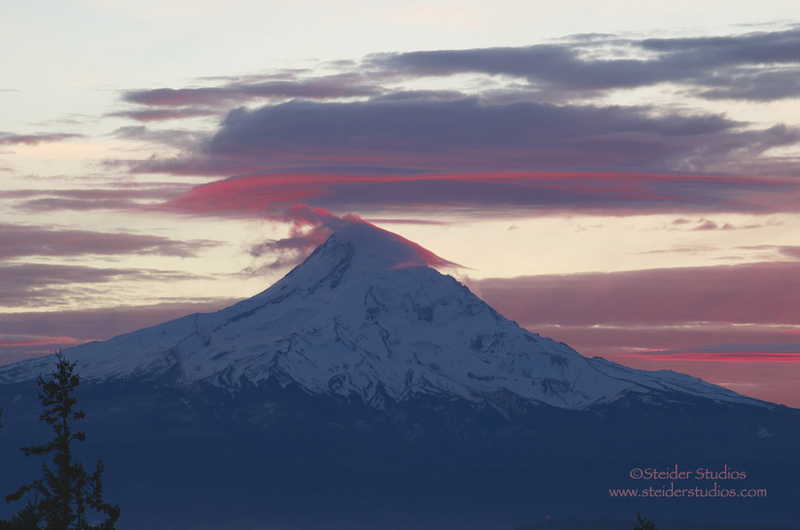 Mt Hood with a brilliant red cloud curling over her snowy white cap was the last bit of color to fill my soul. 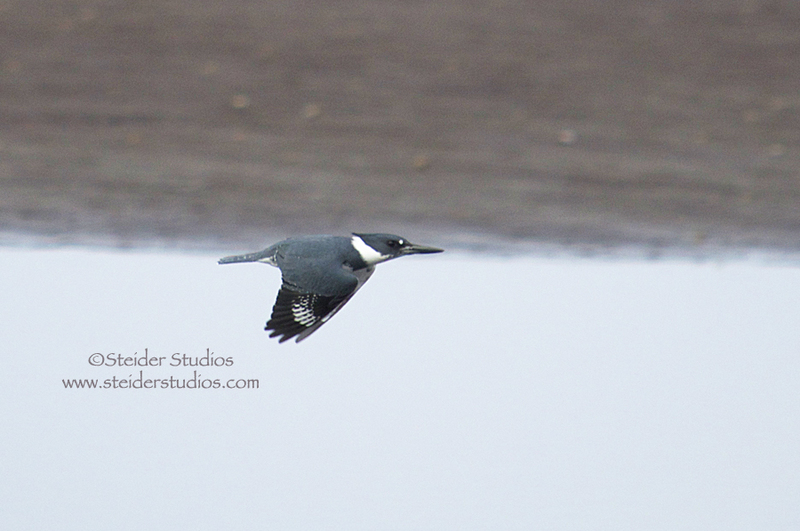 The day had a magical start when I found a Kingfisher & caught him in flight! The last day of 2013 I caught this juvenile Red-tailed hawk in flight. Today I entered him in a Project FeederWatch contest. 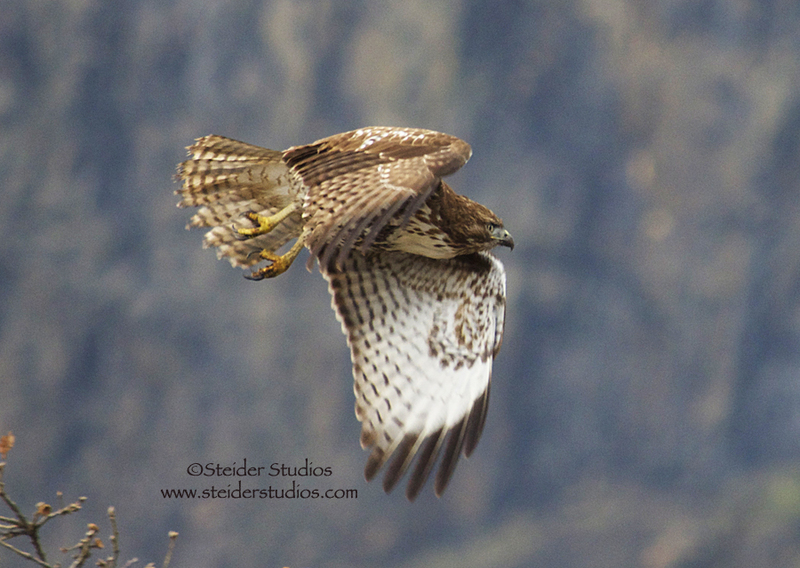 Do me a favor and vote for my photo: Simply click this link and vote for my hawk in flight. Thanks!! You only have until tomorrow night (Sunday, Jan 5th) to vote!!! 2014 is off to a wonderful start! I can’t wait to see what’s next!! 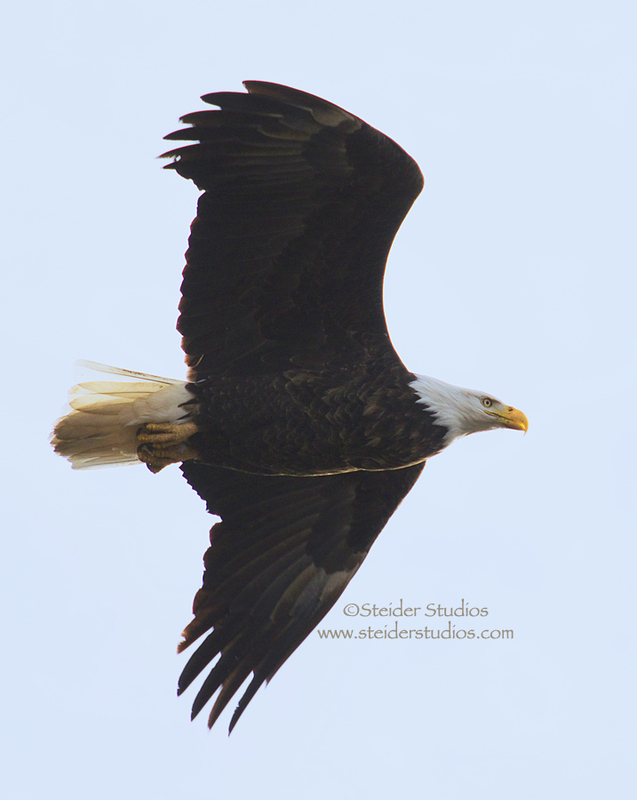 I had a glorious ending to 2013 and a fabulous beginning to 2014 chasing eagles along the Columbia River. 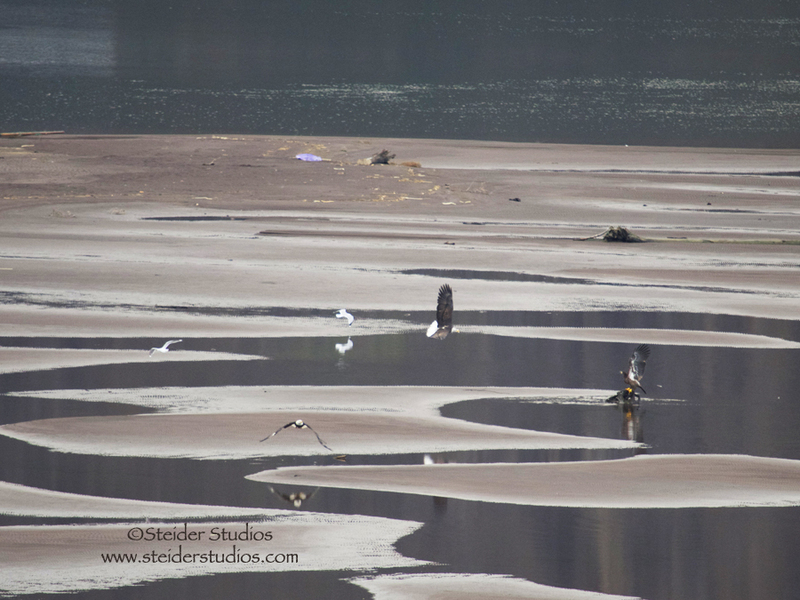 They congregate where the Klickitat River meets the Columbia River. Fog has covered the river most days with sun breaks from time to time. 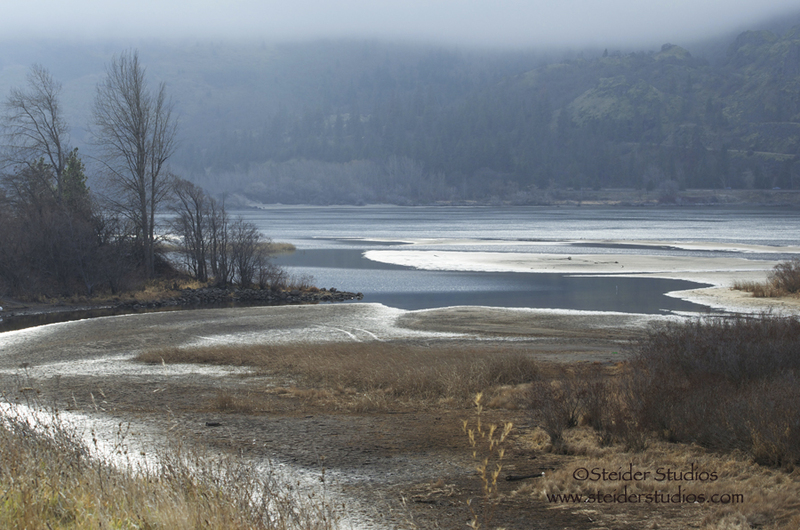 I’ve been traversing the Columbia near Lyle daily this last week and plan to continue until the eagles are gone. 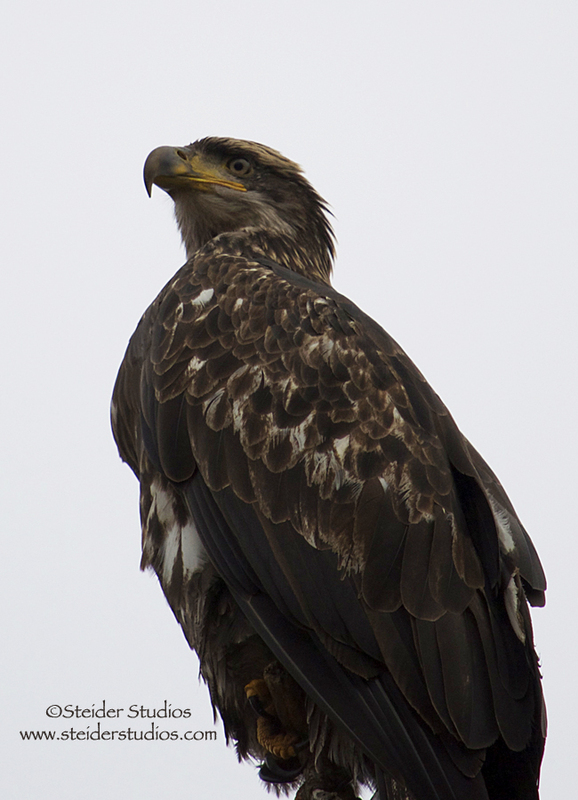 Today, eagle expert Tim Pitz led a small group of us on an ‘Eagle Outing’ along the Balfour trail from the Memaloose Tasting Room in Lyle. To our astonishment, this juvenile stayed perched on the trail while our group carefully and quietly made our way around her. Tim pointed out the blood still on her talons and her swollen crop indicating she had just eaten. 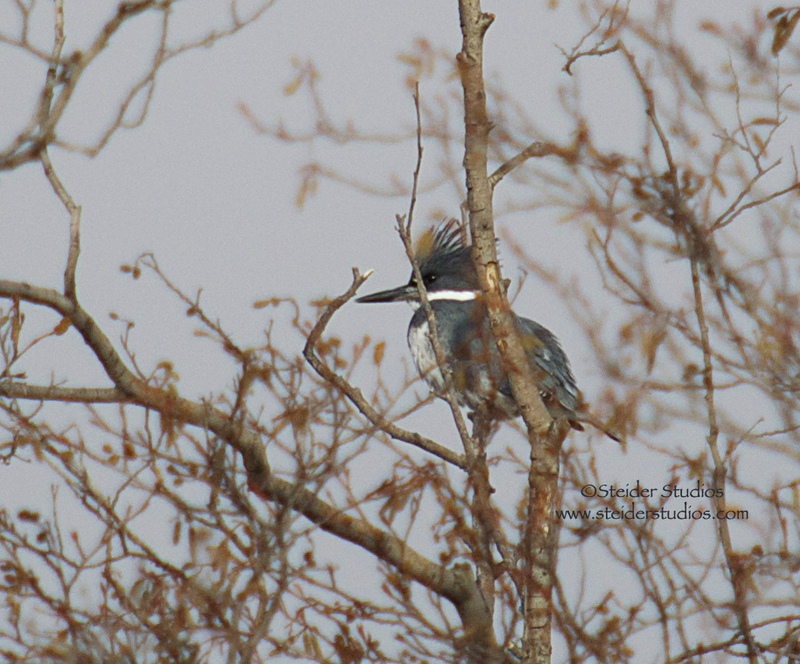 Prior to the event I was at the water’s edge looking for a Kingfisher that I recently discovered. He didn’t disappoint. I was lucky to see him dive in the water twice just after his call that sounds like maniacal laughter. Here’s another shot of him from a few days ago when I first discovered him. After today’s event the river had filled up with people fishing so I headed home. Stopped at the Bingen Marina in time to catch some geese flying off, but I saw no more eagles. Yesterday I was lucky to catch this hawk flying. I’m told it’s a juvenile Red tail. 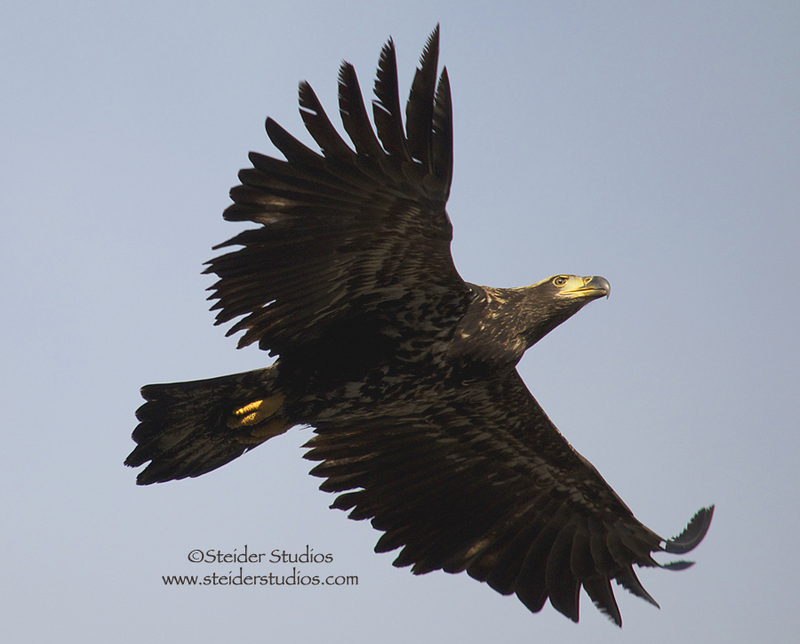 A couple days ago a juvenile bald eagle graced me with his presence. 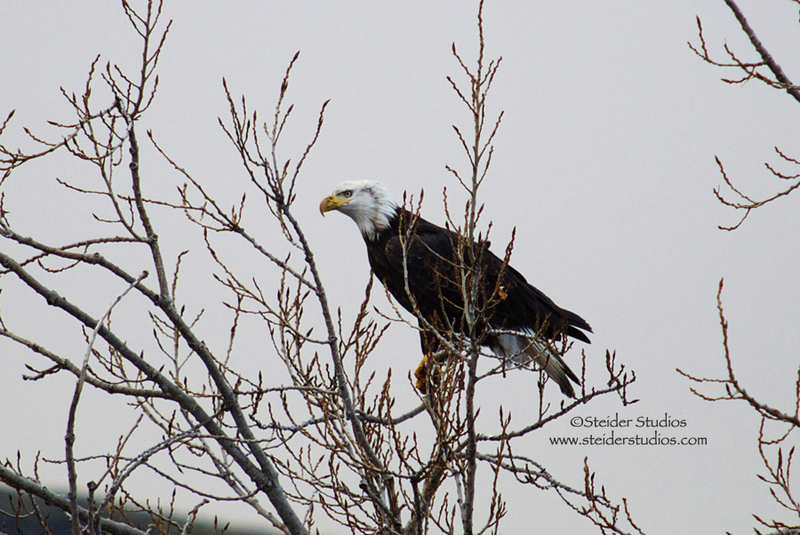 The same day I was lucky to have this bald eagle fly right in front of me. 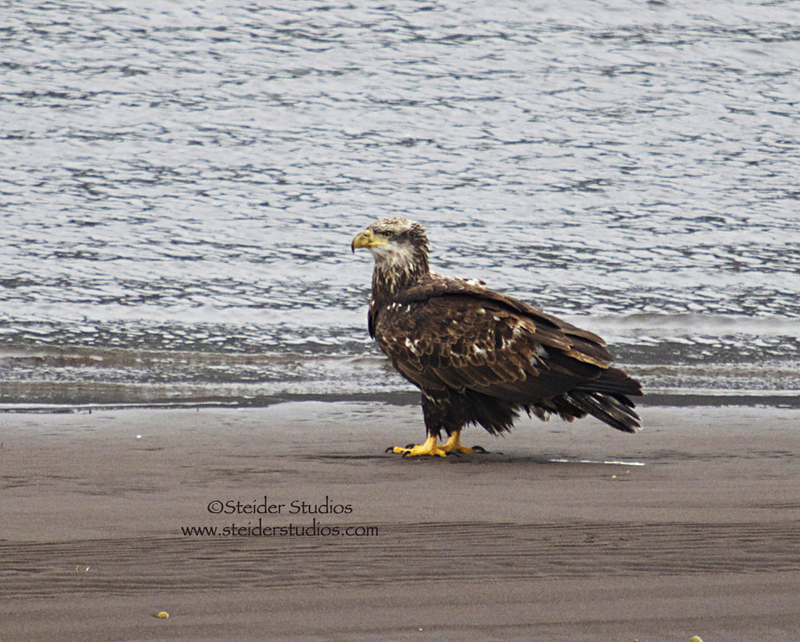 And this motley juvenile was the only eagle on the beach while I searched for the Kingfisher. 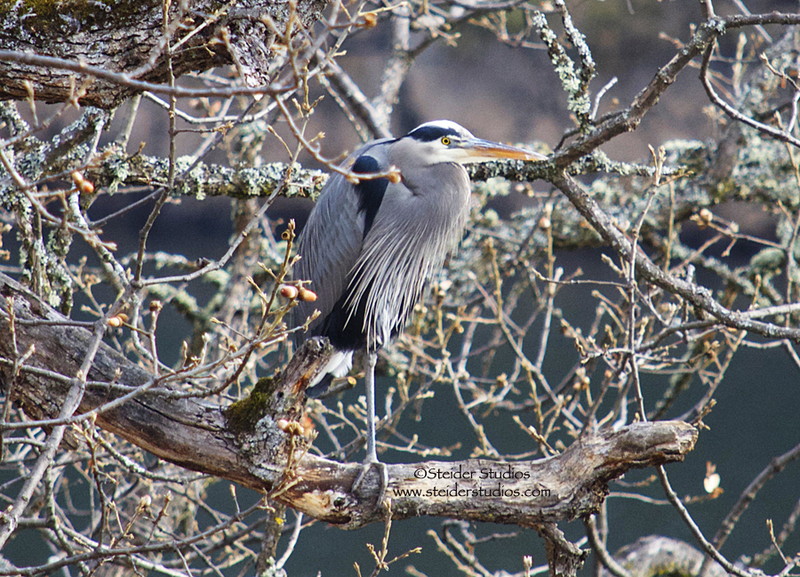 Yesterday a friend and I missed this heron hiding in a tree as we hiked by. Fortunately her husband pointed him out to us as we hiked back out! The last few days have been amazing. 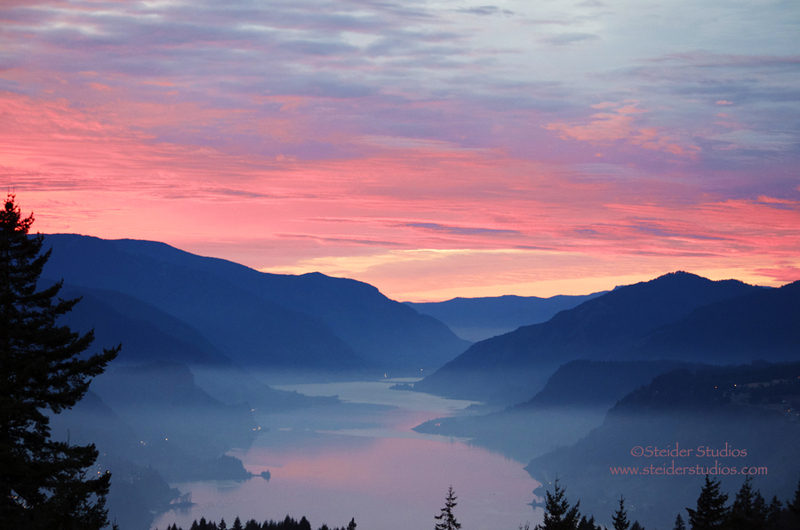 I’m so lucky to live here, in the Columbia River Gorge. I can’t wait to see what unfolds tomorrow! 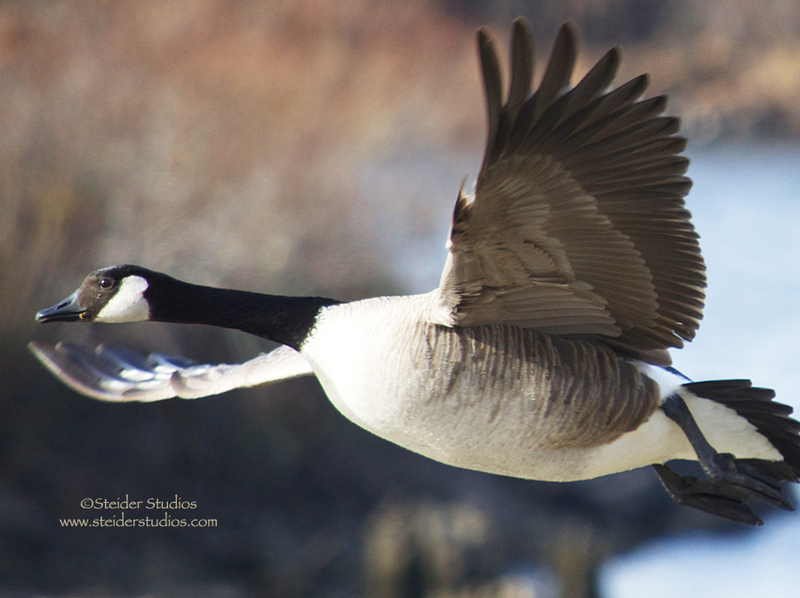 And I really can’t wait until my new Tamron 150-600mm lens arrives!